Harp guitars have been around for a couple of hundred years and while the shape of the guitar can vary, it is basically a guitar with an extended arm which accommodates bass strings used for plucking while the guitar is being played. There has been a resurgence in the popularity of the harp guitar with some notable players like Michael Hedges, Muriel Anderson, Don Elder, Will Eaton, Kaki King, Pat Metheny and others championing the instrument, and with the modern era of custom guitar makers there are numerous luthiers who have put their stamp on this unique instrument. 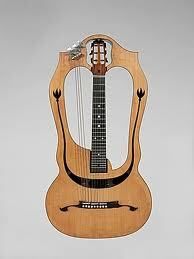 Stephen Bennett is one of the top players of this instrument and is the founder of the Harp Guitar Gathering. His original compositions are beautiful but here I've decided to post his arrangement of Jimi Hendrix's The Wind Cries Mary played on a Holloway Harp Guitar.